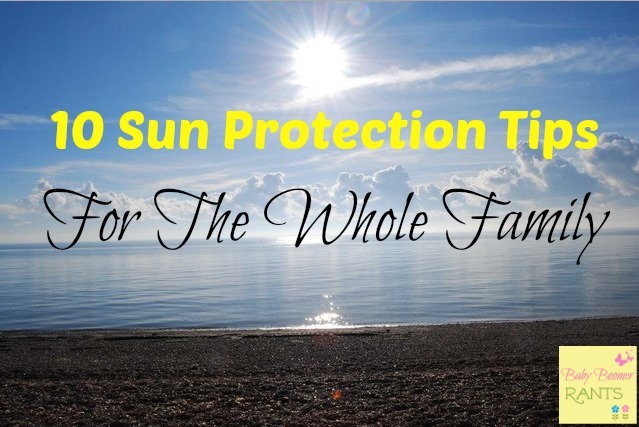 10 Sun Protection Tips For The Whole Family! You are here: Home / Family Living / Parenting / 10 Sun Protection Tips For The Whole Family! School’s out and the kids are ready for some summer fun! With no school and longer days it’s the perfect time of year for everyone! From swimming, hiking, bike riding, picnics, or kickball in the street, summer is a favorite time of year for young and old! Wear clothes that will protect you from the sun, such as: wide brimmed hat, protective clothing, and 99-100% UV protection sunglasses. Plan ahead and make sure your clothes cover well but, are light and weather appropriate. Be sure to use that sunscreen on cloudy days as well as sunny days! According to the American Academy of Pediatrics and American Association of Dermatology you should use sunscreen with UVA and UVB protection and an SPF of at least 15. Put sunscreen on 30 minutes before going out in the sun and reapply it every 2 hours or sooner if you’re sweating or swimming. Don’t forget to put sunscreen on any part of your feet that will be uncovered. A foot sunburn is not fun! Try and keep your activities shaded or find shaded areas as often as possible. Stay hydrated. Carry a water bottle with you and use it often. Don’t forget the dogs. When walking your dogs, be sure to carry water for them and stop when needed to let them drink. Use pet safe sunscreen on the exposed areas of your pet. make sure it’s pet safe, remember pets are prone to licking themselves and can get dangerously ill if you use human sunscreens. Check with your vet to be safe. So, be sure to have fun, but be smart about sun protection for the whole family! Enjoy your summer!